Weekends mean Pizza around my house. 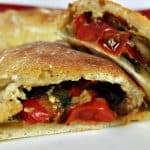 Only this time I switched things up a bit by making these Italian Calzones and filled them with a yummy Avocado Garlic Alioli. All wrapped up in a toasty Calzone Pocket smothered in an Ailoli Sauce made from Fresh Garlic, Avocado, and Tofu. Is that Ay-lee-oh-lee or Eye-oh-lee? Regardless of how you pronounce it – it’s good. Think of it like a Garlic Mayonnaise – without all the eggs and oil. 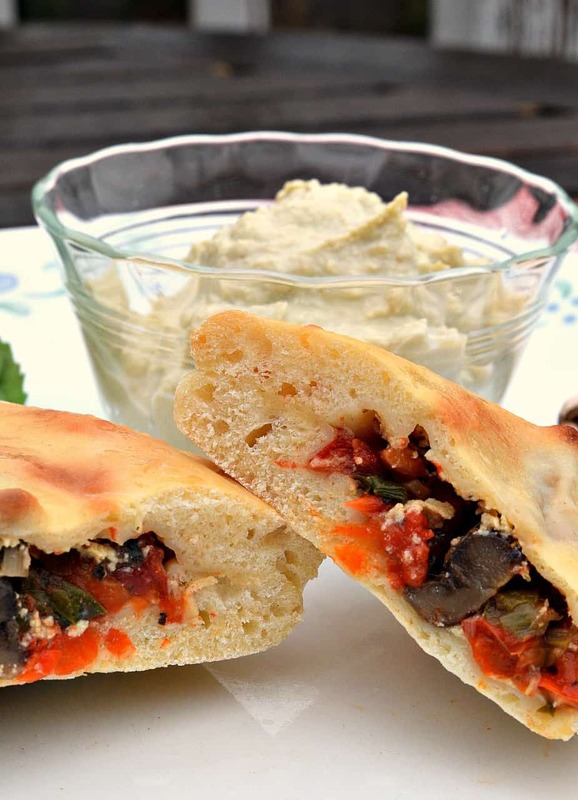 And it was just the right sauce to add to these yummy Calzones to give it all that amazing Italian Flavor. Who says Pizza has to be boring! 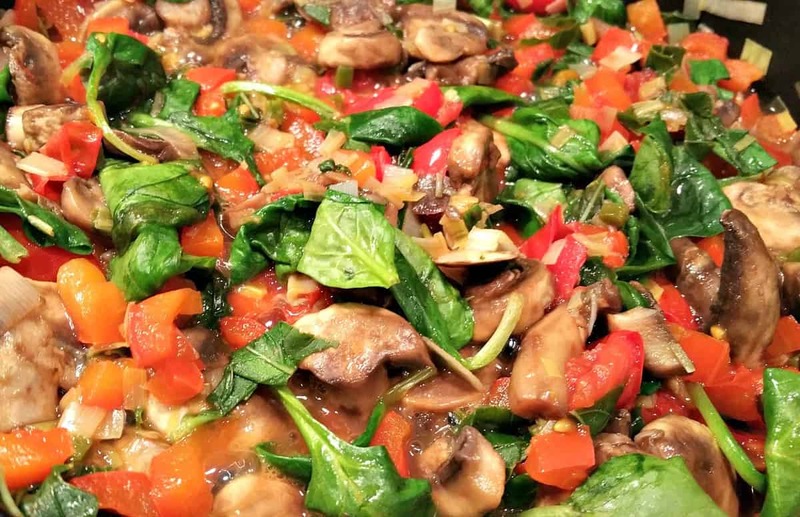 For the veggie filling, I simply sautéed a diced Leek, a Red Bell Pepper, an 8oz container of Fresh Mushrooms, 12 Cherry Tomatoes, and a handful each of Fresh Spinach and Basil. Let all that veggie goodness cook through until they’re nice and soft and then stir in a teaspoon of Balsamic Vinegar to bring it all together. The smell is heavenly! This will be sure and get people into the kitchen to see what’s cooking! For the Calzone Dough I used my basic Pizza Crust, like the one I used in this Avocado Pesto Breadstick Recipe. And then I simply reduced the recipe down to a single dough ball. So you’ll need some flour (I like King Arthur Bread Flour) but you can sub in some Whole Wheat. You’ll also need some Active Dry Yeast, Water, Sugar, and Salt. That’s really all Pizza Dough is: Flour, Water, Yeast, and Salt. You can sprinkle in a little Garlic Powder or Italian Seasoning if you want but that’s up to you. Once you’re dough comes together, cover it with Saran Wrap and a Kitchen Towel and let it rest for about 15 minutes. Then simply scrape it out onto a well floured surface and work it until it’s not sticky anymore. The Sauce is the easy part – simply add all the ingredients to your blender and pulse until you got a rich, creamy sauce. Be sure and scrape down the sides every so often. I used a 12oz tub of Tofu, 3 Tbl of Lemon Juice, 2-3 Garlic Cloves, a ripe Avocado, 2 tsp of Dijon Mustard, and a teaspoon of Yellow Miso. Add water by the tablespoon to get the consistency of mayonnaise and salt to taste. Your dough should have risen nicely by now, so cut your dough ball into 8 even pieces. Now roll out one of these until you have about a 6″ circle. Slather a good helping of Alioli over the entire surface and then lay about 1 Tablespoon of the filling in the center. Fold the dough over to make a half-moon shape and pinch the edges to seal. Traditionally you used an egg-wash to make the dough brown and crisp up. For this recipe I borrowed a trick I learned from Board and Knives and used a combination of water, corn starch, and molasses which worked very well. Simply brush this mixture on top before baking and you’re all set. Bake in a 450° F oven for about 15-20 minutes. 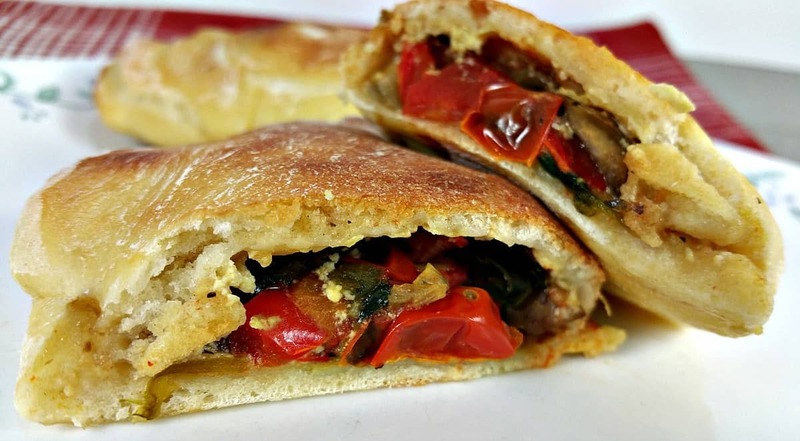 Change up your Pizza night and try these Italian Calzones. You won’t be sorry! Savory Italian Calzones stuffed with Mushrooms, Spinach, and Basil and smothered in a rich Avocado Garlic Alioli Sauce. Pizza night will never be the same! Using a stand mixer, add flour until rough dough ball is formed and dough pulls away from sides. Use leftover Alioli Sauce or Marinara Sauce as a dip! This is perfect! Looking forward to trying it very soon! What could i use as a substitute for tofu? I would love to try this recipe, however, tofu does not love me. I have tried a couple of your recipes, orange chicken and cauliflower tacos. My husband and I were happily surprised at the good taste. We have recently decided to introduce more plant-base food recipes into our diet. Looking forward to eating more of your tasty dishes.